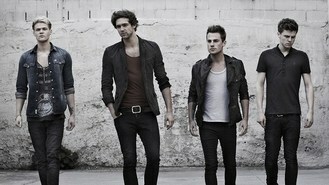 The four-piece guitar pop band released their debut album Chapman Square in October 2012 and have just come back from a promotional tour of the US. Andy revealed: "They barely understood a word. I had to speak a lot slower. Posh Scouse, I had to go for. But then some people in the UK can't understand me, so it's nothing new." And he is pleased by how well the band were received in America. He said: "It was incredible. This wasn't the first time we've been, but we still weren't expecting the reception we got in New York and Toronto in Canada. The shows were all sold out, and we did some great TV appearances, such as Access Hollywood and MTV. It's amazing considering we haven't released a single over there yet." Asked about the current success of UK artists in the US, Andy said: "I think music fans in America just appreciate good music, so Coldplay have obviously been big there for ages, and Mumford & Sons more recently, and The Script. I think they just like UK artists, and musicianship."